Total: 0.000000, Delta: 0.000000, Running Data Query . Total: 0.000000, Delta: 0.000000, Found Type = '6' [Script Query - Script Server]. Total: 0.000000, Delta: 0.000000, XML file parsed ok.
Total: 0.080000, Delta: 0.080000, ERROR: Data Query returned no indexes. Can someone help me to solve this Problem ? If you look at the XML file, check that you are receiving data via SNMPWALK for the OID's that it is using (especially the indexes part). The likelihood is that your device either doesn't respond to that OID or SNMP hasn't been configured properly on the Device or within the device's details in Cacti. If you look at the XML file, check that you are receiving data via SNMPWALK for the OID's that it is using (especially the indexes part). There is no OID in the XML file. 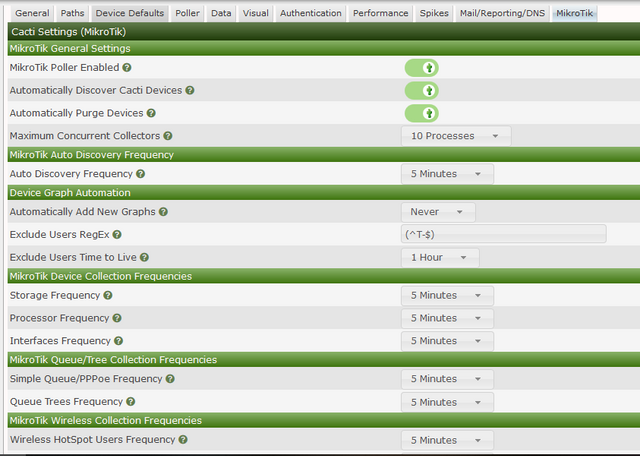 or SNMP hasn't been configured properly on the Device or within the device's details in Cacti. Please assist me further. Thank You. Try hitting the green circle with the arrow on the line of the interface query. That will generate a verbose listing of what Cacti is receiving. That may shed light on your issue. I'm so confused right now, What should I do next ? Let me jump in... I found this topic after trying to solve the exact same problem psdnano described. The only difference is that I'm running Cacti 1.2.0 on a Centos 7 server with PHP 7, the Mikrotik plugin version is the current one from Github and RouterOS version on the router is 6.43.7. I get the same response as psdnano when running Query in debug mode, while I do get listed all the interfaces when run ss_mikrotik_interfaces.php as netniV suggested. Post the contents of a verbose query. Also, please verify that the MikroTik tables are being populated and data collection is enabled. I'm not sure what you mean, can you explain more detail on how to do it please? and data collection is enabled. Of course it's already enabled. Does the current MikroTik plugin that could be found on GitHub works with RouterOs versions 6.40.x and up? I already wrote that I have the exact problem as Psdnano who created this topic while I installed Cacti 1.2.0 on Centos 7 server with PHP 7. In the meantime I tried running a virtual machine Cacti Appliance (from http://www.kevinnoall.com/blog/2015/03/06/cacti-virtual-appliance/). so I could add graphs for them. I run all the tests suggested in this topic and I get the same output as Psdnano does.